Wireless charging pads for smartphones and tablets come in multiple shapes and sizes. Here's one, for example, that is both stylish and practical. But a wireless charger that is meant to be used in a car, on the other hand, is a bit more difficult to find. That's probably why this Nokia Lumia 920 owner decided to make his own using the standard charging pad provided by Nokia. For his hack, he used a set of neodymium magnets, half of which he taped onto the charging pad, and the others were taped on the inner side of a Lumia 920 protective case. Yeah, the whole setup doesn't look pretty, but it is simple and gets the job done, as it is being demonstrated in the video. Hopefully, accessory makers and Nokia itself will take this as an example and come up with a professionally-made car charger for smartphones. it's almost criminal to have a case on this beautiful phone. but i can understand the guy in the video protecting his investment. Wireless charging for smartphones is nothing new, people was making own wireless charging systems even before they were announced by samrtphone manufacturers. Also why just don't use usual charging dock. for me, wireless charging is more convenient. just put my phone down and pick it back up. also i can always keep my phone topped off. also i dont have to keep plugging and unplugging from the jack in the phone which over time goes bad. the wireless charger turns off at full battery so it doesnt ruin your battery. also it's been shown to use very little to no electricity when it's not charging. it's just a convenience thing and i prefer it over plug in charging. "just put my phone down and pick it back up." You can do the same with usual charging dock. Some devices even has separate connections for charging dock. "the wireless charger turns off at full battery so it doesnt ruin your battery." When you charge it in the usual way, it also turns off at full battery. And if you want charge and use your phone at the same time, chargint through cord is the only one solution to do that since wireless charging range is only few millimeters. And if you want convenience and don't want to fumble with cord, you can use usual charging dock Also: 1. Wireless charging is slower than usual. 2. Using wireless charging you are just wasting some % of energy. 3. Wireless charging is not good for your health. lmao @ 3rd one. Nah man, it does nothing. Go search a little. BTW while it may seem a little convenience at first, it's hard to get back to wired charger once you get used to wireless charging. Besides there is not so great difference between charging rate of wireless vs wired chargers. Have you ever heard about EMR ? "And if you want convenience and don't want to fumble with cord, you can use usual charging dock" you sound like you are tellin me what i should be doing. sadly for you i wasnt seeking your permission. "When you charge it in the usual way, it also turns off at full battery." did i say it didnt? "1. Wireless charging is slower than usual." i dont use my wirless charger to go from 10% to 100%. you're right, that would take longer. in that case i would use the wall jack. i use wireless charging to keep my phone topped off (i already said this in my last post). here's an experiment done to show that wireless charging doesnt run up your electric bill. 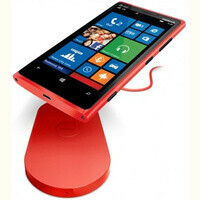 http://forums.wpcentral.com/nokia-lumia-920/204657-nokia-dt-900-wireless-charging-plate-not-power-vampire-thanks-nokia.html "3. Wireless charging is not good for your health." unless you're directly using the wireless charger as a pillow, it is not bad for your health. yes it creates an electric field, but the field is very small and you have to be very close AND be exposed to it for a long period of time for you to physically have an affect from it. am i the only one who noticed this guy has lambo doors? My Lumia 920 manual says to avoid putting it near magnets. It looks like a mouse and doesn't look contemporary! Do you have anything useful to say or are you being a troll.. Again do you feel threatened by Nokia or WP8? Yea look whose talking, the " Troll"